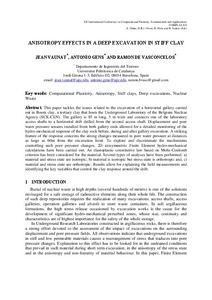 Vaunat, J.; Gens, A.; Barboza, R. Anisotropy effects in a deep excavation in stiff clay. A: International Conference on Computational Plasticity Fundamentals and Applications. "Computational Plasticity XII: Fundamentals and Applications - Proceedings of the 12th International Conference on Computational Plasticity". Barcelona: 2013, p. 1286-1293.